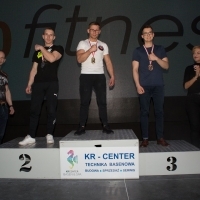 Alex Kurdecha is the athlete of the team "Armfight Piaseczno", the ward of Marcin Lahovich. At first he was just a fan of the Zloty Tur, two years ago he decided to pull there, but the result was not the best. As you probably know - Alex also engages in American football in one of the Warsaw teams. When I found out about this, I immediately convinced Alex to finally decide on – armwrestling or football. But he remained adamant. Alex Kurdecha: I must disappoint you, I will continue to play football and I will combine it with armwrestling. PeSzy: But do you see that these are two completely different sports, they can not be combined? Alex Kurdecha: Just because armwrestling and football are two completely different disciplines, they fascinate me so. In armwrestling, I am alone, and it all depends on me. My opponent and me. I know that if I'm right, I can overcome anyone. In football, we have forty-six guys in the team, eleven on the field. Each has his own specialization. It's like a "war". We are fighting on the principle of "one for all, all for one." PeSzy: Well, I agree, this is the most team game in the world. But... do you really need to play football? Alex, because in arm wrestling you can be at the top of the absolute category, be among the best, you're already there... With this ball that is not round, can you achieve something? Alex Kurdecha: Actually, in Poland there is no such team that plays in the international arena. However, I will not concede. Both disciplines matter. PeSzy: Well, somehow we have to take it ... Tell me, how do you like Zloty Tur? Did you seem to have a good draw? Alex Kurdecha: What does "good" mean? Alex Kurdecha: In the first fight, I got on Sabin Badulescu [Romania]. PeSzy: I do not remember it, I probably went out, not to be nervous. How it was? Alex Kurdecha: I came across the Turk [Arif Ertem], who defeated Saginashvili, then Kvikvinia. The Turk has a strong wrist. I managed to open his wrist, as coach Marcin Lachowicz suggested. Alex Kurdecha: Yes! Mariusz Podgorski said that after this fight I can defeat everyone. It really motivated me. Thank you, Mariusz! The next opponent - Davide Kappa - I pulled toproll and so won another fight. Then there was a fight, after which it was possible to get on the pedestal. Although Tsvetkov was tired after the battle with Silaev, I must squeeze out a thousand percent of myself. I felt the "climate" of the Zloty Tur, I heard support, I was happy. Many thanks to the coach. Marcin Lachowicz was with me all the time. PeSzy: Well, Alex - congratulations! I will not persuade you to abandon football any more. It may be that in your case this combination can give good results. Thank you for talking! Dmitry Trubin: "I need a rematch"